Finally I have enough hair to play around with so I threw my mini twists up into a simple retro updo. The mini twists were done while my hair was dry using worlds of curls curl activator gel as my moisturizer/leave-in/shine booster. If your hair is healthy, natural hair will naturally have a slight sheen anyway, but of course you can never have enough shine! Okay, I take that back, you can have too much shine-*cough* Jermaine Jackson anyone? Anyway, here are my twists completed everywhere except the daggone middle. I swear there is twice the thickness as everywhere else in the crown section of my hair as it takes twice as long as everywhere else to twist this section up! It is not necessary to do mini twists on dry hair, however, I do them occasionally because I want to "show off" a little length every now and then. As I said in this video, the Worlds of Curls Curl Activator gel really works best on damp or wet hair. That is why I always apply the product to my freshly washed hair first. On this occasion I then placed my hair in big twists or braids and let it air dry before I took them down to do the mini twists. I liked this style a lot and I wore it like this for about a week. Every night I just took it down and redid it in the A.M. I don't like sleeping in hairstyles and updos if I don't have to (too much tension...have you seen my poor edges lately lol). This style is pretty old (I did it around the second week of March), and I did shoot a tutorial way back then too. The video will be up pretty soon on my youtube channel so be on the lookout for it! BAM!!!! Not bad if I say so myself. Here's to 6 more inches this time next year for you and for me! I shampooed my hair with Suave's Rosemary Mint shampoo and then followed that up with a 20 minuting conditioning session with Aubrey Organics Honeysuckle Rose conditioner. Immediately after that while my hair was still soaking wet, I twisted my hair up into the twists above. It took about 1hr 30 minutes to complete. Not bad at all, so expect to see more big twists in the future as right now I really don't have much time for much else. 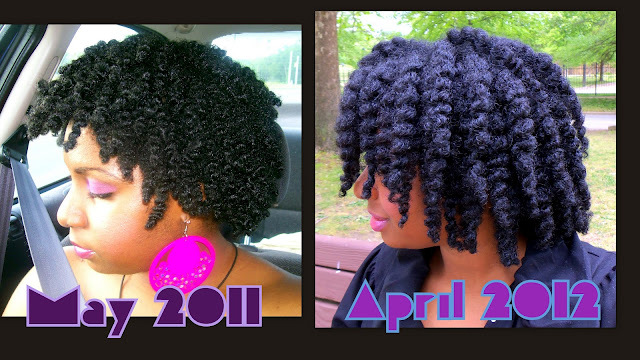 Fast-forward to today and I unleashed my twists to reveal a twist out that had a lot of hang time. 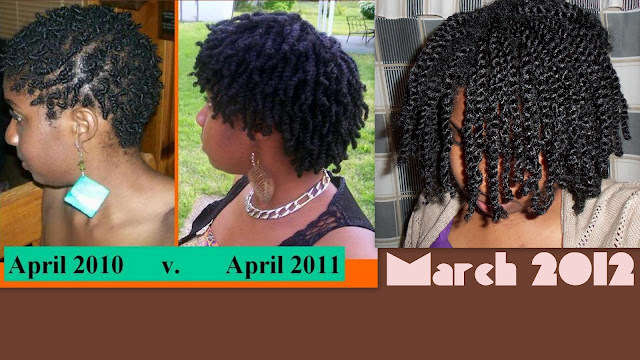 I smoothed a little of Hairveda's Almond Glaze Pomade on my fingers and used it to take down my twists. It added a "teeny" bit of shine but I attribute most of the shine to the World of Curls curl activator gel that I put on my hair when I first did my twists last week. Unfortunately, most of this definition was nonexistent pretty much 30 minutes after I took these pictures (gotta love natural hair!!). I plan on wearing it out for this one day, shoot a promo video for the Return of the Curls event that is happening in Richmond on Saturday, July 28th, and twist it back up and rock the twists for about another week. Honestly, it is just too much work to keep twisting and untwisting my hair everyday and dealing with the single strand knots and tangles that come from it. It just isn't worth it to me. Welp, that is pretty much it for now. This week I will try to play catch up and post a few old styles and style tutorials from earlier this year. Check ya later! I'm on the cover of Natural Bloom Magazine! Okay this is BEYOND late but erh ra um....I'm on the cover of the Natural Bloom Magazine! Shout out to JC of The Natural Haven for the love. This issue of The Natural Bloom is one that you don't want to miss out on-inside are tons of pictures of beautiful natural hairstyles for those of us with short to medium length hair. I already have my eyes on a few styles that I will be replicating in the future! That's all for now ya'll, I have to get back these books!